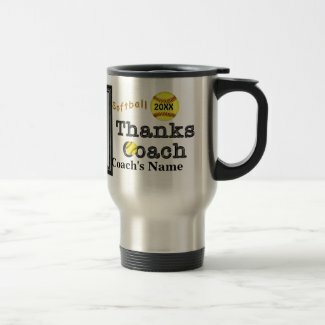 Unique PERSONALIZED Softball TEAM Gift Ideas, COACHES and gifts for softball moms and dads. Starting at Softball Gifts UNDER $5 and Up. Really Cool Softball Gifts Ideas for Players and Coaches multicolored metallic looking unique softball gifts to traditional yellow softball gifts. Customize it with the Team’s NAME, Players Jersey Number and Name, Year, Coach or Delete any or all text. CALL Linda to HELP you Customize with Your Team Colors and Type in Each Player’s NAME and NUMBER on this Personalized Softball Mug for your Coaches or create one with your Team Colors: 239-949-9090. You choose. These make great Softball Gift Ideas for the Players and coaches. Easy to use Text Box Templates make it easy to Personalize Each Softball Player’s NAME, One at a Time, “Add to Cart” and Go Back to personalize the next one. OR Type in the SAME Text for every player, such as the Team Name, Year or just type in a special short message or softball saying. See Quick INSTRUCTIONS on How to Personalized Softball Gifts, Below. I created some great Softball Gift Ideas for Players and Coaches with no customization needed, so you could just order and go, but personalizing it will make it more special to the girls and coaches. I love this multicolored softball with a rainbow of colors with a metallic look to it. 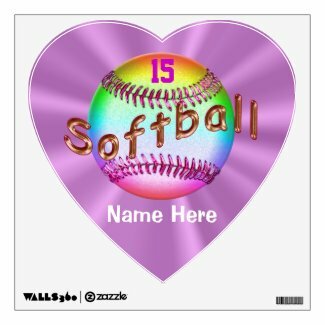 Clicking this great big softball will take you to my Zazzle store category with ALL my Custom Softball Gifts. Be sure to look at the Mugs for Coaches. They are very popular gifts along with the softball keychains. Even young kids like the keychains to put on their softball bags or backpacks. Cool Softball Gifts Ideas for Players and Coaches. I strive to create different looking and cool Softball Gifts for everyone. The coach or player will really enjoy these Cool Softball Gifts Ideas for Players and Coaches. Makes the perfect Cool Softball Christmas Gifts Ideas. Softball Gifts Ideas for Players and Coaches. Once you are on the softball gifts page, look to your right under “Personalize it”. Below that are the templates to Type in YOUR TEXT or DELETE it by Highlighting it and typing or deleting. To Upload YOUR PHOTOS, Click on the tiny blue word “Change” underneath my temporary image and follow the prompts to “Upload New Images” and or “Select Images to Upload”. You will then find your image from your computer. I made the template so a typical proportioned picture will fit. Now CLICK OK. To move or more options, Click the Customize it button. 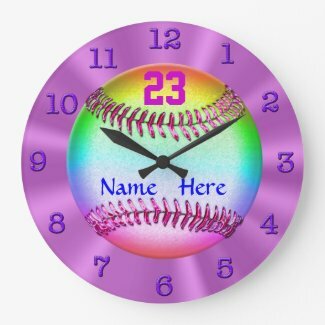 Softball Gift Ideas that Girls will love the metallic look multicolored softball with glassy look beveled pink threads yet I’ve also created the traditional yellow softball stuff for girls, coaches, teams and their family members who are so proud of their girls. Stand out designs are original creations by Little Linda Pinda Designs. Personalized these Softball Coach Gift Ideas that will be remembered forever. They are so cool with the wooden like “Thanks Coach” lettering and the fun copper gold Grunge background bursting out with a softball in the glove. Write your text on the inside of the card or buy it as you see it. To Customize, Click the “Customize it” button, “Add Text” and Type in your text. Call Linda if you would like me to make modification to any of my designs or I can put them on different products for you. Cute Softball Themed Bedrooms and Fastpitch Softball Necklace. Personalized Pretty pink satin look background with silvery Softball ball with a cool glassy looking softball scrolled across. 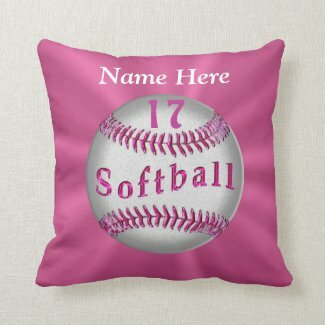 On Softball Pillow product page at Zazzle, Type in her Name and her Jersey Number into the text box template. You can choose to DELETE any text too. 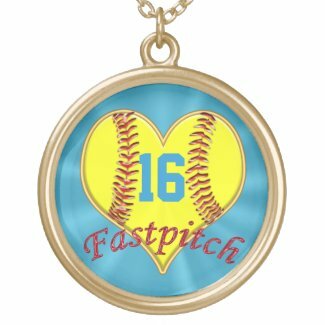 Fastpitch Softball with yellow Heart Shaped Softball on Turquoise background with her Jersey Number. Unique Softball Gifts Ideas for Players. Cute Personalized Softball Gifts with your Softball Players Name and Number. Cool Personalized Softball Shirts for Mom and Softball Mom Jewelry. These are really neat Softball Gifts Ideas at the beginning of softball season, especially. They make great Softball Christmas Gifts also. Mom will proudly wear her softball player’s Name and Jersey Number on her softball mom shirt. 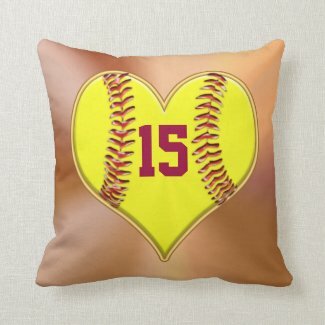 Cute and neat Softball Gift Ideas for Softball Bedrooms for Girls. Coordinating Gold Keep Calm and Play Softball Posters and Personalized Pillows. This poster is very popular on Pinterest. People are re-pinning it. So many really cool Softball Gifts Ideas. 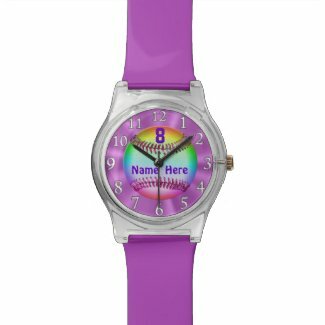 Softball Gift Ideas that She will LOVE and cherish these cool Softball Clocks with her Name, Jersey NUMBER or MONOGRAM. How about Removable Softball Wall Decals. Vibrant Radiant Orchid satin look background. Radiant Orchid is the color of the year. These are my Two Top Selling Softball Coach Gifts. In fact, I am so happy to say, as of writing this article today, that several of my softball designs are in the Top 10 Softball Gifts. This is thrilling to me because I put my heart into creating these cool Personalized Softball Gifts for Coaches and the Girls. Notice the glassy looking threads on the yellow softball keychains. 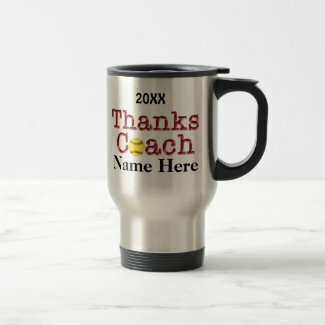 The “Thanks Coach” has a metal look to the lettering. Type in the coaches Name, Year, Delete it or write the team name in. It’s all up to you. Thank you so very much for shopping with Little Linda Pinda Designs. I really appreciate it more than you will ever know. Considering purchasing Bulk Softball Keychains personalized with each and every players name and jersey number on it. 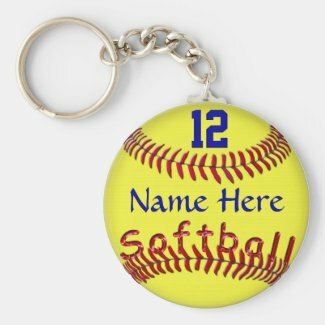 (for individual names, you need to personalize ONE softball keychain at a Time, then “Add to Cart” and Go Back to personalize the next key chain. It won’t take long with the easy to use text box templates. Otherwise, just type in the same text into the text boxes. Instead of the player’s name, type in the TEAM NAME and instead of the player’s number, type in the YEAR. Then you can order them all at once. 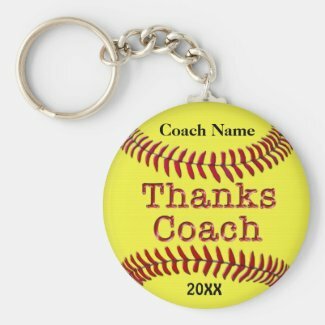 Same with the personalized softball coach gifts. Keep the text the same for all coaches if you want to order them all together. The Coaches will love the Stainless Steel Travel Softball Mugs with cool designs. Practical and a neat way to show their support for their kids. I hope you are enjoying all the Softball Gifts Ideas. I can help you and you will see it before you buy it. Cool Softball Gifts Ideas for Coaches. Unique TEAM PHOTO MUGS for Coaches. See the Instructions in the Product Description are or look below to see how to Upload your team photo to this cool stainless steel coach mug. Type in your coach’s NAME and the YEAR to make it a softball gift they will always cherish. They will love how neatly it fits into their cup holder. Keep the beverages cold or hot and a lid that easily turns to close. I LOVE my own mug from Zazzle. The Mugs are Beautifully detailed and vibrant printing. Zazzle is “Second to None” when it comes to the amazing robotic printing they do on quality products. You can email me your photo and I can upload it for you. It is BEST to call me, Linda, at: 239-949-9090 and then email the photo. I get so much email, you might get missed. I’ll even crop or brighten up your photos if you wish. You will see it before you buy it. Photos turn out darker on the stainless mugs. You can choose the WHITE finish for brighter pictures. How cool will this be for your coach to receive a gift that will last for years and he will be reminded of the great team he helped by looking at their photo. Keep his beverages cold or hot with this quality stainless steel travel mug. Outstanding printing quality. Choose in stainless or white. Both are stainless on the inside instead of plastic. The stainless helps keep your beverage either hot or cold longer. Add YOUR TEAM Photo, YEAR and Coach’s NAME to these Coach Mugs. 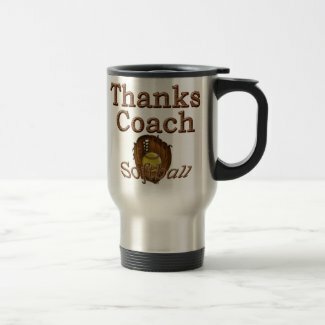 CLICK on Softball Coach Mug to Buy or See more Details. 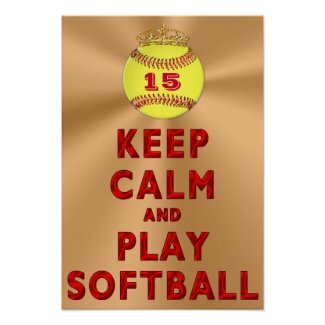 If you would like to go directly to my Zazzle Store, please CLICK HERE to View ALL Custom SOFTBALL GIFTS or CLICK on the Softball Stuff image. 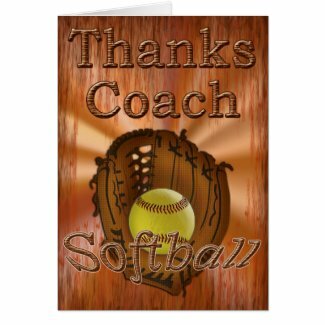 I really appreciate and want to Thank you for viewing Personalized Softball Gifts Ideas article. Be sure to call me if you would like me to make any changes for you.